a good cup of tea or a large coffee can illuminate better possibilities. was swimming with information, most of it mildly irritating or partially worrisome. as a few small toys he thought his classmates would enjoy seeing - especially the red PowerRanger figurine. He felt that this time he'd be able to persuade his teachers that it was acceptable. Somewhere during our 5 minute drive to school I'd persuade him otherwise - which was the usual. I was not angry. Not, at least, with him. My own self...well... that was another matter. Monday morning, the possibility of a little free therapy might just do the trick. red PowerRanger, I laid out all the garbage that was swimming through my mind. glanced in the rear view mirror to see that his head was down, as if in deep contemplation - he was staring at the red PowerRanger figurine. confessed?" He looked up at me as we came to a stop and I could see in the mirror that his eyes were clear. He said in the most firm voice, holding up his red PowerRanger for me to see by way of visual example: "Daddy, I think I like the GREEN PowerRanger more than the RED PowerRanger." we kissed and then he disappeared into the school to his waiting teacher inside the door - who also looked as though her eye hairs were pointy too. I couldn't be sure of it though. I'm sorry for this goofy picture but...just get over it! this recipe for seaweed pate is super good for you and your kids will love it! this is so yummy on bread, or swedish hard bread (we eat siljans knackbrod). I'm telling you kids love it, especially younger kids that don't have the distinction yet of seaweed. it lasts for a few days in the fridge and it's great for pregnant women and also breast feeding moms because of the huge amount of calcium! we also eat hijiki sauteed with carrots and Franny just stuffs it in her mouth!...she loves it! this cantilever on the Guthrie Theater has a balcony that overlooks the Mississippi River and the St. Anthony falls...incredible! 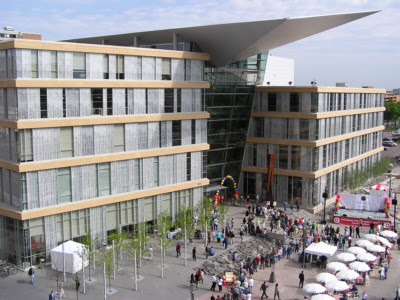 Minneapolis is one of the only cities that subscribes to the 5% tax club (dating back to the 1960's), this means that fortune 500 corporations give 5% of their pre-tax profits to support the arts....now how about that for giving back! (and there are 18 fortune 500 companies based in Minneapolis!) You can see the results when visiting Minneapolis, they have finally completed five new AMAZING buildings starting with the Walker Arts Center (my favorite! 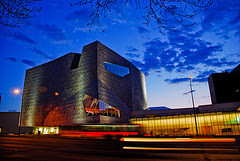 below), then the Children's Theater, the Minneapolis Public Library, the Minneapolis Institute of Arts, and finally one of the most breathtaking of all the Guthrie Theatre (photos above...if theater is your thing you should live here!) across the street from the Guthrie is a wonderful, vegetarian restaurant called spoonriver, don't miss it either...it's all just stunning to see a city so committed to the arts! bob's java hut was quite cute too, just across the street from french meadow...I loved the big open window! three years ago, when visiting my family in Minnesota I took a visit to Jackson Meadow...it's hard to explain how deeply I fell for this completely lovely project, the architecture (by david salmela), the land (by shane cohen) and even the kids that I saw playing on the common grounds, Jackson Meadow is simply put, the most well planned community I have ever seen. The wonderful ideas that were brought together to create this community, from it's land conservation, common septic and well, just simple things like un-attached garages (believe me this is unusual in Minnesota! ), so that you get out of your car and maybe give your neighbor a 'hello'. I also think that if you live in a community this beautiful you have to have something deep in common with your neighbors. Visit the Jackson Meadow website and find out more and if you want to create a community like this, please tell us because we do too! I was in Minneapolis again this last weekend and I will be posting a bunch of wonderful things about this little gem in the north! When I first started feeding Ida solids I was a little concerned about how to make sure she got all the nutrients she needed. When you read all the things they (and we) are supposed to have it seems like an awful lot of eating and preparing for one day. Then I had the idea of a milkshake for her morning snack, or whenever it fit in, filled with natural nutritional supplements, and it makes my life so much easier with less pots and plates to wash and takes a minute to prepare. You can put in whatever you think your little one needs and likes. 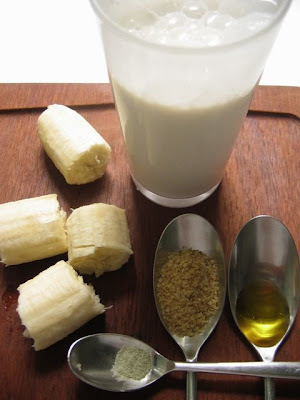 I use a base mix of milk and rice milk, usually add a banana, then flax seed oil, sea vegetable powder and wheat germ. I often add tahini for protein or yogurt if she's been lacking in that. There are so many variations and she has never turned it down! Don't forget to take care of yourself and make enough for you both.